Bollywoo: Bodyguard Shatters All Records. It's official, the Salman Khan starrer "Bodyguard" has shattered all previous first week records set by Ready, Dabangg, 3 Idiots and Ghajini. As expected the film had a phenomenal first week - collecting Rs. 105.43 Crores in nett collections in the first 7 days - becoming the first Hindi film ever to collect 100 Crores in the first 7 days. Beginning on opening day itself, Bodyguard shattered the 1st day collection record of 14.5 Crores nett set by Dabangg last year by collecting 21.60 crores. The film broke the opening day records in all circuits accept one (Tamil Nadu/Kerala). On the second day Bodyguard also held its own and continued on the record breaking pace by collecting 19.50 Crores again beating the 16.5 Crores record of Dabangg. By day 3 (Friday) Bodyguard had broken the first 3 day record of all previous films by collecting 14.17 nett and bringing the grand total to 55.27 Crores (The previous 3 day record was 49.5 Crores by Dabangg). Advanced bookings of Bodyguard were sold out for the first 5 days at many locations. Not surprisingly, on the fourth day, the collections picked up slightly, when Bodyguard had collected 15.13 Crores at the end of Saturday night. Collections on Sundays usually pick up but no one expected to see the great jump Bodyguard took when it earned 18.68 Crores on its 5th day. After the first weekend the collections of a film drop substantially during the weekdays - but Bodyguard was rock steady as it collected 9.09 Crores on day 6 and 7.34 Crores on day 7 bringing the first 7 days grand total to Rs. 105.43 Crores. 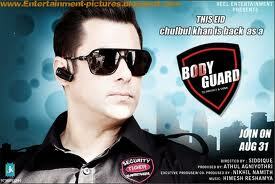 Bodyguard has been produced by the husband/wife team of Alvira Agnihotri (Salman Khan's sister) and Atul Agnihotri. Last year it was his brother Arbaaz Khan who was reeping the benefits of Salman's Eid release, this year it's his sister's turn. 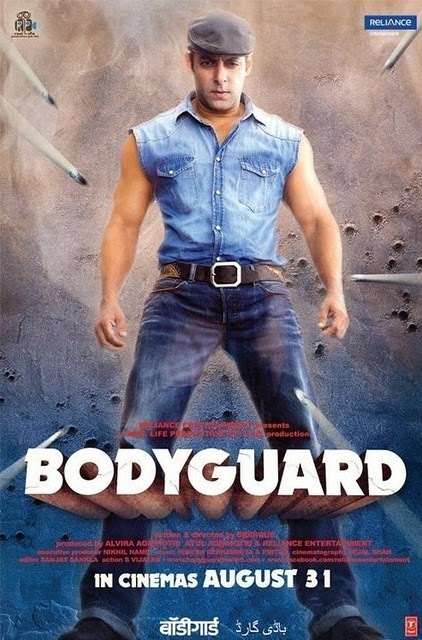 Now what remains to be seen is if Bodyguard can hold on to break the all time record of Rs. 189.38 Crores in collection set by 3 Idiots to become the highest grossing blockbuster in Hindi cinema. brinkka2011 says: Thank you for the wise critique. Me & my neighbour were preparing to do some research about that. We received a great book on that matter from our local library and most books where not as influensive as your information and facts. Im really glad to see this kind of facts which I was searching for a long time. Salman Khan Has Done It Again!